"Loving with all your voice fulfills the blue ray"
"Everything teaches you the truth, until you learn"
In nature we recognize blue as the colour of water, the rain, rivers, the sea and even a mother's womb. Blue cleanses and calms and brings peace to mind and body. In many religious practices you will see a lot of blue, the Virgin Mary and Jesus both wear this colour, this is because it is recognised in relation to truth and someone who can be trusted. In the case of royalty we talk of 'blue blood'. Blue within our aura increases spiritual awareness. If your purpose for developing your spirituality is to be of service to others then the blue within your aura will increase. The blue ray calls for self analysis, to help you to learn to live properly and truthfully. Blue is the colour of the fifth chakra the throat chakra. The focus of this chakra is on your ability to be heard and to be understood. Being able to communicate that truth that you feel in your heart. If the throat chakra is in balance you will be confident with self expression such as writing, art, speaking and presentation skills. Think about how you communicate with the world. The ultimate lesson is who you are and what you communicate will reflect directly back to you. A crystal that works well with the throat chakra is sodalite. This crystal is great for sore throats or hoarseness. It will cool a fever and lower blood pressure. Sodalite also facilitates spiritual growth. It helps you to release old thought patterns and mental conditioning and is particularly useful for phobias and panic attacks. It brings silence of thought which allows our consciousness to expand. Place sodalite around areas of your home to bring calm and peace and clear any negative feelings. Sodalite is also great to use when doing tarot readings. If you hold a piece of sodalite before you do a reading it will clear your mind and help open up your intuition, it will help you focus your thoughts and help speak only the truth. The tarot cards associated with the number 5 are The Hierophant (5) and Temperance (14). 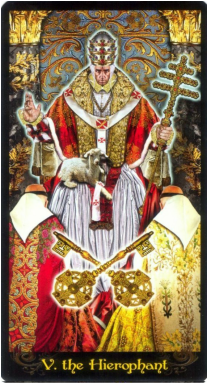 If the hierophant is the revealer, he shows us we must look for someone who tell us something that is currently hidden. If this is your soul card then blue will be your personality colour. You will have an amazing ability to communicate with everyone, no matter if they are king or pauper. You will have a natural ability to know what is right and what is wrong. A blue personality will struggle sometimes to show their tender side however they do feel things very deeply. A blue's life purpose is to help others, especially those less fortunate. Speaking the truth is of up most importance to blue's, anyone who tells them lies will not be trusted again. They are very good at reading people too and are very loyal. They are very keen learners and constantly look for teachers to gain more understanding. On the downside blues can be somewhat reclusive and show a moody temperament, feeling 'blue'. 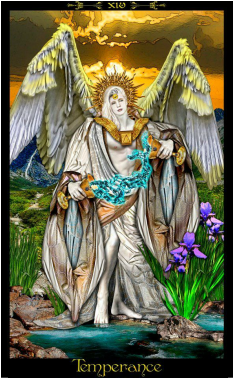 The hidden teacher card for blue is Temperance, he is the healing angel, use this card if you need to bring balance to the subconscious and consciousness and thus bring peace of mind. Allow his life force energy to flow through you. Blue can help in the treatment of nervous disease as it has a calming effect. It is also great for bringing down a fever as it has a cooling effect too. Blue will help strengthen the lungs and voice box, or any condition related to the throat. Blue can also help with inflammation of any kind and can be useful for stings or headaches. If you want a really good nights sleep then decorate your bedroom in blue, similarly for a relaxing tranquil time decorate your bathroom blue. Water has the greatest power of all the elements. The Archangel of the blue ray is Michael, probably the most powerful archangel, he will shield and protect you, he calls on you to speak your own truth, with his light you will feel more powerful, more secure and confident. The blue ray is the first ray the ray of strength and protection. Ask him to protect you each morning so that your actions and words are in line with your higher purpose and feel that protective shield of love and light.